Don’t be one of the 27% of businesses unhappy with their internet provider. * Find the best ISP near you now. This article has been updated to reflect recent provider changes in plans, pricing, and customer-satisfaction reviews for business broadband. Also, thanks to a major upgrade in its satellite internet speed, Viasat has overtaken HughesNet as our recommended rural internet provider, and we’ve added a review of CenturyLink’s fiber-optic and high-speed internet services. When we started researching business internet service providers (ISPs), we were overwhelmed. What’s the difference between cable and DSL? Is speed or customer service more important? What in the world is latency? It left us feeling like small-business owners have a tough road ahead of them when choosing an internet provider. But after analyzing the data, we found that a few providers stand out for different reasons. We’re confident that our picks for best ISPs will keep you online and on budget, leaving you free to tackle more important tasks—like running and growing your business. Data effective 10/20/2018. At publishing time, pricing and speeds are current but are subject to change. Offers may not be available in all areas. The right combination of fast and reliable speeds, competitive pricing, and positive customer service earned Verizon the number-one spot for the best small-to midsize-business internet. Verizon’s fastest plan, Fios Gigabit Connection, has advertised speeds of 940 Mbps download and 880 Mbps upload. Speeds this fast enable your business to do data-demanding activities like downloading and sharing huge files, holding HD video conferences, and processing complex point-of-sale and cloud-based applications. Starting at $214.99 per month, Fios Gigabit Connection isn’t cheap, but for the speed, it’s one of the most affordable plans in its class. Unfortunately, the plan isn’t widely available. Still, Verizon offers several other Fios plans ranging between 75 and 500 Mbps—each with symmetric speeds, which means the download speed matches the upload speed. We’re also impressed that Verizon guarantees 99.95% uptime. With that kind of reliability, your connection would only be down 0.05% of a given month—translating to about 22 minutes. If you experience more broadband service downtime than that, Verizon will give you a bill credit. In addition to limited fiber availability, we found some weaknesses that you should consider before settling on Verizon. Verizon’s DSL plans are slow, ranging from 1 to 15 Mbps in download speeds. And the prices for these sluggish plans can be expensive when compared to other ISPs. For example, Verizon’s Business Internet 1 Mbps DSL plan is $39.99 per month, while Frontier’s same-speed plan starts at just $20. The many complaints about latency we uncovered online and on social media also concern us. High latency—ping or lag in other terms—leads to issues like choppy streaming, disrupted conferencing, and other headaches. Overall, there’s a lot to love about Verizon—even if it’s not all gold medals for the company. We’re confident your small business can run smoothly on a Verizon business internet plan. Read our Verizon business internet review. To get the best customer service and technical support for your small-business internet, we recommend AT&T. If having spectacular customer service is your number one priority, we recommend AT&T. With this provider, you can choose from a wide range of both DSL and fiber plans to get the speed and price that works for your business. At the low-end of the spectrum is AT&T’s DSL plans, starting at $60 per month for a 25 Mbps download speed. In some areas, you can also choose the $60 Business Fiber 25 plan that has matching 25 Mbps download and upload speeds. We think these plans are best for the newest small businesses because they’re a good price-per-speed value for offices that need basic online functionality like web browsing, email, and business communication. Alternatively, AT&T offers gigabit connections for businesses that need a ton of internet power. The Business Fiber 1,000 plan is pricey but packs a serious punch if you need to connect a dozen or more devices at a time for heavy, collaborative internet use. Where AT&T shines the most is customer service and technical support. Although Verizon ranked a bit higher in customer satisfaction by ACSI,3 we gave AT&T more points for providing free, 24-hour technical support for its small-business customers. You have to pay extra to get that kind of service from Verizon. AT&T also serves up an enticing smorgasbord of technology services. For no extra cost, you get unlimited data usage, cloud storage, and backups—plus 10 email accounts and a wireless gateway that can connect up to 10 devices. What’s more, AT&T throws in a free security suite from McAfee to protect your crucial business data. Work late hours? Most business internet service providers don’t offer free 24-hour support. Think how you’d feel if your connection went down and you couldn’t get help, and then consider whether a provider with 24/7 technical support is necessary for your business. Read our AT&T business internet review. Our overall winner for best small-business internet is also our runner-up in the customer service category. That’s because Verizon beat AT&T in J.D. Power’s 2017 US Business Wireline Customer Satisfaction Study in all three measured market segments.5 If Verizon keeps it up, it may soon win our next Best Customer Service award too. If you need a fast, affordable, and no-contract option for business internet, Spectrum is your best bet. Spectrum (a Charter Communications brand) provides business cable internet with no contracts and a 12-month price guarantee. These details are great if you don’t want to lock yourself into a lengthy contract and a price that may not fit your long-term budget. You don’t get the widest array of internet speeds with Spectrum—100, 200, or 300 Mbps downloads are your only options. But these three plans represent some of the best-priced options for moderate speeds. There’s even more to like about Spectrum business internet, especially if your small-to-medium-sized business needs to keep your customers or guests entertained with in-house TV. Spectrum’s bundled Triple Play internet, TV, and phone package gives you fast internet speeds, dozens of HD TV channels, and a solid phone service for just under $100 per month. We also love all the technology upgrades Spectrum bakes into its internet plans. Cloud backups up to 100GB, 25 custom email addresses, a free leased modem, a unique Wi-Fi network, and 5GB of web hosting compose just some of the perks you can use to tailor your internet to your business’s needs. Plus, your data will stay protected from hackers and spammers with Spectrum’s proprietary security software. But be wary of the weak points. Spectrum’s cable plans have slow upload speeds when compared to similarly priced fiber plans. And speaking of fiber, we were hard-pressed to uncover exactly where Spectrum offers the service, which means it has some catching up to do on the high-speed front. What else? Spectrum’s reputation with customers leaves a lot to be desire: the company’s ACSI ratings dropped a notable five points in 2018. Read our Spectrum business internet review. Spectrum isn’t the only no-contract business ISP on the block. AT&T gives you the option to eschew contracts on all of its fiber plans—and has a better customer satisfaction rating. But AT&T tends to charge more for lower-speed plans, so we still think Spectrum wins this match. 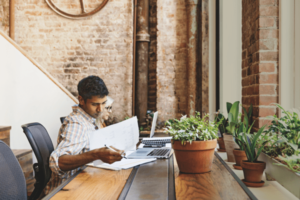 Businesses in rural areas may not have many options for connecting their office to the internet—but where it’s available, Viasat is the best choice. Viasat (formerly Exede) is one of only two US satellite internet providers, with its competitor being HughesNet. When we compared the two companies—by price, speed, data limits, and more—Viasat delivered a decisive win. Viasat offers business customers satellite download speeds up to 100 Mbps, with upload speeds up to 4 Mbps. HughesNet, on the other hand, can deliver downloads only up to 25 Mbps. No matter the provider, satellite internet’s limitations include higher latency, slower speeds, and less data use allowances than many land-based connections. Also, as you may have noticed, significantly higher monthly prices. But Viasat lets you choose from a range of plans that give you soft data limits—from 1 to 200 GB total—that can work for small-business owners, or even a home-based business. Read our review of Viasat business internet. Once again, AT&T grabs the runner-up position but, this time, for rural offices. As an alternative to satellite internet, you can get AT&T Fixed Wireless, which uses radio towers to connect your office to the internet. Get speeds up to 10 Mbps with professional installation and included Wi-Fi. Frontier has the cheapest fiber plan and an impressive integrated VoIP solution for small businesses. Frontier offers the cheapest introductory fiber internet plan we could find. For only $19.99 per month, you can get fiber speeds up to 15 Mbps. That’s fast enough for small offices with just a few employees who use the internet frequently. They can do online research, share and download files, and run basic cloud services with relative ease. Low prices for basic fiber and a stellar integrated VoIP solution makes Frontier a solid multi-service option. If that’s not enough for your data demands, you can purchase fiber plans up to 150 Mbps to satisfy your internet-hungry operations. Most Frontier plans come with a 36-month price guarantee—one of the best we found. Voice over Internet Protocol, or VoIP, is an alternative to traditional phone services that uses your internet connection. With most Frontier internet plans, you can add AnyWare VoIP service as an impressively comprehensive solution for handling employee, customer, and conference calls. However, Frontier Communications doesn’t have the best reputation, even in an industry that tends to have dismal customer ratings overall. From its below-average ACSI rating to its F grade from the Better Business Bureau,6,7 Frontier has a lot to work on. But you may not have many options when choosing between small-business internet providers. And customer service ratings may not be your first priority—price, reliability, or technology may be more important, for example. So if that sounds like you, we think you should consider Frontier a worthwhile choice. Read our Frontier business internet review. If TV is a must-have for your small business, Spectrum is an excellent choice for bundling your internet services. With special promotions for bars and restaurants, you can get internet speeds up to 300 Mbps and HD-ready TV—all with no contracts. Or go for the Triple Play plan and bundle internet, phone, and TV in one sleek package. For cheap DSL business plans and sheer availability, CenturyLink is tough to beat. If your business is located in an area served by CL fiber-optic internet, even better. CenturyLink business DSL service is widely available across the US, and it’s relatively cheap compared to most other providers. CenturyLink’s DSL plans range from Business Internet 10 (10 Mbps download), at $60 a month, up to Business Internet 100 (100 Mbps download), at $104.99 a month. For offices that rely heavily on the internet for video conferencing and transferring large files, springing for a more expensive upper-tier plan is highly recommended; for low-priority tasks like emailing with clients and web browsing business ideas, lower speeds are usually sufficient. Like other major internet providers, CenturyLink sped up its US fiber-optic internet expansion in response to the build-out of Google Fiber. So far, CenturyLink’s fiber reach isn’t as wide as Google’s or any other competitor’s (it’s currently available in only 10 major cities), but it does offer attractive fiber plans that include 1 Gbps download/upload speeds, cloud data backups, and an impressive array of business add-on services and bundling options in select areas. Both CenturyLink’s DSL and fiber business plans come with 24/7 support, though the company’s customer-service ratings are middling to poor. But if your small business is on a tight budget, CenturyLink’s DSL plans are among the cheapest you’ll find. The fiber plans also provide a lot of bang for your buck—though unless you’re in the western or southeastern part of the country, you’ll have to wait. Read our CenturyLink business internet review. You may have noticed a major player missing from our top five best small business internet service providers list: Comcast. The oft-maligned company didn’t make the cut for our favorite either, but that doesn’t mean there’s nothing to like about its services. Comcast offers the very best reliability guarantee we could find. A 99.998% uptime guarantee means that, with Comcast, you should expect your internet to be offline less than a minute per month. If keeping your business online nearly 100% of the time is vital, consider Comcast. Just be wary of the ISP’s dismal customer ratings, expensive prices, and hidden fees. Read our Comcast business internet review..
We’ve shown you our top picks for business internet, but how should you go about finding the right one for you? The answer depends on a few factors—like price, speed, and reliability—and how you weight each factor in importance. Let’s break down how to pick the right ISP for your business. First, a taxonomy of business internet. Nearly gone are the days of dial-up internet, in which businesses and residents had to tie up their phone lines to get online, only to be left waiting for super slow internet loads. Now we have access to several types of high-speed broadband internet, some with lightning-like capabilities. Cable internet: Just like the TV service, cable internet delivers high-speed internet through coaxial cables, skipping telephone lines altogether. Cable internet tends to be faster than satellite and DSL but slower than fiber. Yet cable can suffer from limited bandwidth and slower speeds during peak usage times because you often share your connection with other subscribers. DSL: Short for Digital Subscriber Line, DSL technology uses existing copper-wire phone lines to provide high-speed internet. But unlike dial-up, DSL doesn’t interfere with phone services, so you can run both at the same time. DSL is widely available in the US—more so than cable or fiber—but doesn’t often reach the same download or upload speeds as other options. Fiber: As the newest tech on the block, fiber-optic technology works by sending internet data encoded in photons of light across flexible glass or plastic fibers. Fiber internet speeds can reach 1 Gbps, and many connections have matching download and upload speeds for blazingly fast and reliable internet use. But fiber’s newness means that it’s not yet available for many customers, and it tends to be more expensive than other broadband services. Satellite: Many businesses don’t have access to cable, DSL, or fiber. But thanks to satellite technology, nearly anyone can still get connected. Satellite ISPs beam your internet to you from their orbiting stations. The downside is that satellite internet suffers from lagging latency and expensive plans with data caps. Your business may have just one or two internet types to choose from, so your next step in choosing an internet service provider may be considering price and speed. If you’re budget conscious, price is going to be a key factor for your office. Fortunately, several providers offer low-cost, introductory plans with speeds ranging from truly basic to modestly fast. Price and speed may be important, but even the fastest or cheapest internet plan won’t be worth your business’s expense if you can’t rely on it when you need it. Because reliability is so critical to business internet customers, some ISPs offer reliability guarantees. A reliability guarantee means that an ISP agrees to provide you a certain level of service—and if it fails, you get a bill credit. Although no ISPs offer a 100% uptime guarantee, some get pretty close. Reliability guarantees come in two types: uptime and latency. Uptime guarantees refer to the percentage of time you can expect your internet service to be online. Although no ISPs offer a 100% uptime guarantee, some get pretty close. Latency measures how long it takes for data to make a round trip between you and your connection’s origin. Measured in milliseconds, high latency—sometimes called lag or ping time—can disrupt video streaming, VoIP calls, and other real-time services. Here’s another look at the uptime and latency guarantees offered by some of the top business ISPs. As with many business services, you may have to sign a contract to connect your office to the internet. Contract lengths for the providers we reviewed range from zero to two years. Some contracts come with automatic renewal, and some include trial periods and price guarantees. In addition, aside from your monthly internet price, ISPs may charge you certain fees for installation, activation, or early termination. Think about how long of an ISP agreement you’re comfortable locking your business into. Check the table below to compare contract terms and fees. How much do you rely on your internet connection for fundamental business operations? If a service outage would seriously impact your office, you need to know if you can count on your ISP to respond to a problem and find a solution quickly. It’s no secret that the internet industry has a far less than perfect reputation. Anyone can easily find online complaints about slow speeds, lagging reliability, poor customer service, and more for any of these companies. However, not all providers are the same, and there are a few ways to judge an ISP’s overall performance with customers. Look over the table below at some of the ratings we think are important to consider. You’ll also want to consider is the technical aspects of your internet service. Some brands offer a bunch of tech services for free, while others charge a premium. If you’d like to set up separate Wi-Fi networks for your employees and your guests, look for a provider that offers that option. If you’re concerned about protecting your business and customer data, consider an ISP with a comprehensive security suite. And if you’ll be backing up large amounts of data to the cloud, check to see if your provider limits how much you can upload. Here’s a comparison of each brand’s technology perks. *Once you reach data limit, HughesNet throttles your speeds to between 1 and 3 Mbps. Nearly every internet provider tries to draw customers into bundling services together. You can add phone and TV services to most internet plans from the providers we reviewed, and many of these packages are worth the investment because they can lower your overall costs of individual services. Many bundles come with limited promotional offers, so shop around to see if you can find a combination that works for your office. The final consideration is the simplest: what’s available in your area? Because internet service—aside from satellite internet—relies on networks of wires built by the ISPs, not all providers or plans are available in every area. What’s more, providers often offer some plans and services in only certain markets, leaving many small businesses with just a couple options. For a quick and dirty way to find out what’s available in your area, enter your ZIP code into the tool on this page to search highspeedinternet.com. Sorting through all these providers and plans can be overwhelming. Some plans offer just a few while others give you a huge range of plans to choose from. But what’s the right one for you? The internet terms bandwidth and speed are similar, but not exactly the same. Bandwidth refers to an internet connection’s maximum capability for delivering data between two points. Speed, on the other hand, is the maximum rate of data transfer per second that you can expect to get from your particular plan. Internet providers control the amount of speed each customer gets from their connections. Because business ISPs tend to market their plans in terms of speed, we prefer to compare them using that term instead of bandwidth. Speaking of which, that leads us to the next question . . .
How much internet speed does my business need? This is where you can really start to make comparisons. Some businesses have super basic internet needs—just one or two users doing research, sending email, and running a few online services. Other organizations need to connect many employees and devices and run sophisticated point-of-sale or cloud-based computing services. We’ve laid out some typical use cases for business internet speed in the table below. See where your office fits, and then find a provider that can deliver what you need. Residential or business internet: Which should I choose? There’s no physical reason that business internet should be separate from the kind that’s delivered to homes. In fact, you can run your home-based business using a residential network if that’s what you prefer—but you may experience significant drawbacks. Business internet may be more expensive than residential internet, but it comes with several advantages too. From reliability guarantees to faster upload speeds, a business internet plan is likely to be far more valuable for running your office. Here’s a detailed look at why. Bandwidth and speed: Business plans often come with more bandwidth and faster speeds than the plans that residents can get. For offices that need a lot of fast data access, business plans are usually the smarter choice. Guarantees: Some providers offer businesses service level agreements (SLAs), or guarantees, to ensure that you’ll get what you paid for. Internet uptime reliability, latency, and technical support response are all areas where you may get guarantees not offered to residential customers. Static IPs: If you need to host your own web server, allow remote network access, or whitelist your own website (something many marketing companies need to do), you need an IP address that doesn’t change. Business internet plans let you purchase one or more static IPs. Upload speeds: Crucial to uploading large files without interruption and using interactive services like VoIP, upload speeds matter to many businesses. Several business plans—especially the fiber-optic types—offer much higher upload speeds than you can get with a residential connection. What are my rural high-speed business internet options? Cable, DSL, and fiber broadband internet have expanded throughout the United States, but many rural areas are still left without connections to these terrestrial services. But don’t despair if you’re in one of these locations—you’ve still got options. Satellite internet: Just about any US business can get internet from a satellite ISP. There are only two options—HughesNet and ViaSat—and satellite internet tends to be slower and more expensive than land-based internet. But as technology improves, you may find yourself with access to satellite speeds that match today’s fiber plans in the near future. Fixed wireless: Another option for rural businesses is fixed wireless technology. Using radio towers, providers transmit internet service to wireless receivers in your office. Speeds tend to be even slower than satellite, but the connections can be more reliable and may not come with satellite data usage limits. T1: It’s not commonly offered anymore, but T1 connections offer dependable, basic internet to many US businesses. T1 services use dedicated copper-wire phone lines but tend to be slower than DSL connections that use similar technology. Bandwidth is the total physical capacity of an internet connection to deliver data from one point to another. An umbrella term for many types of high-speed internet, broadband internet is distinguished from older dial-up service for its “always on” connection that doesn’t interfere with phone lines. Using coaxial cables like you see in many homes, cable internet is one way businesses can get high-speed internet. Some cable networks use newer hybrid fiber coaxial (HFC) technology that combines coaxial and optical fiber cables. Copper wires deliver phone services to millions of American businesses—and DSL internet travels along these lines too. If you were born before the year 2000, you probably remember the dial-up internet days. Even businesses used to use this now-obsolete internet access that required your modem to dial a phone number and wait for an answer to get connected. Digital Subscriber Line (DSL) is a type of high-speed broadband internet service that uses copper wires to deliver data to businesses and residents. But unlike dial-up connections, DSL internet doesn’t interfere with phone services and is much faster. Fiber-optic technology can deliver blazingly fast internet over glass or plastic cables. Fiber internet is newer and less available than DSL, cable, or satellite connections. Some rural businesses can get internet by connecting a wireless receiver to signals sent by radio towers. It’s an alternative to satellite internet for businesses that need reliable access. Even at the highest speeds, it takes time for internet data to move from one point to another. But some connections are faster than others, and the ones that lag behind have higher latency. Satellite internet has the highest average latency because information must travel tens of thousands of miles to orbiting stations and back. Fiber-optic technology offers the lowest latency. Orbiting the planet are dozens of high-tech satellite stations, many of which are used to deliver high-speed internet to businesses across the globe. Satellite internet is a godsend for rural offices that can’t access other types of connections. Every computer that accesses the internet is assigned an Internet Protocol (IP) address. Traditional connections use dynamic IPs, which means they can change over time as the ISP sees fit. But some business operations require unchanging—or static—IPs to function. You can’t expect your internet to work perfectly 365 days a year, unfortunately. But you should be able to expect high reliability from your business ISP. Uptime is the percentage of time—such as 99.9%—measured over a month or year that your internet is connected. Voice over Internet Protocol, or VoIP, services allow you to make and receive phone calls using internet technology. The name comes from the process of turning sound into packets of data that are sent using Internet Protocol (IP) computing language. Our goal is to give business owners the information and tools they need to run their business well. And we can confidently say that Verizon wireless is the overall best business internet provider. Verizon is the most reliable option and offers the cheapest gigabit connection around. But just because Verizon is our favorite doesn’t mean it’s the right choice for every small business. Consider one of our other top picks for customer service, rural access, or other categories, and then read our reviews to get even more details about each company. Thanks for reading—now let us know what you think. Do you have experience with one of our recommended providers, either good or bad? Tell us in the comments below. * Based on J.D. Power’s 2018 U.S. Business Wireline Satisfaction Study, which measures customer satisfaction across several factors, including cost, reliability, and customer service. † Data effective 10/20/2018. At publishing time, pricing and speeds are current but are subject to change. Offers may not be available in all areas.